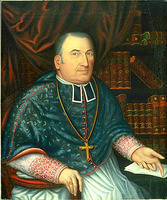 TELLIER, RÉMI-JOSEPH, Jesuit priest; b. 9 Oct. 1796 at Tavaux (dept of Aisne), France; d. 7 Jan. 1866 at Montreal, Canada East. Rémi-Joseph Tellier entered the noviciate of the Society of Jesus at Rome in October 1818. Before his ordination in 1831, he taught at various colleges of the society in France and Italy. 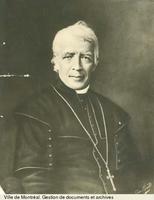 From 1833 to 1837 he was rector of the Collège de Chambéry in Savoy, and held the same office at the Collège d’Aoste in Italy until 1840. In 1842 he was one of nine Jesuits to respond to an appeal of Bishop Ignace Bourget*, who wanted to reestablish the Jesuits in Canada. He reached Montreal on 31 May and on 2 July settled into the presbytery at Laprairie (La Prairie), the Jesuits’ temporary residence. The Jesuits had been the first officiating priests and the seigneurs of Prairie-de-la-Madeleine in the 17th and 18th centuries, and at Laprairie the society began its second career on Canadian soil. On 30 Jan. 1844, in a letter to Father Clément Boulanger, his superior in France, Father Tellier expressed some hasty and pessimistic judgements on the future of Canada. “According to all appearances,” he wrote, “the tottering French Canadian nation will soon sink down and expire; but catholicism will unite with England and so everything will be saved. At least such is the hope with which we like to beguile ourselves.” Nevertheless, these views did not prevent him from devoting himself heart and soul to his parish which included 4,036 Catholics and 45 Protestant families. He was one of the country priests who in the autumn of 1847 went selflessly to aid the Irish victims of typhus in the sheds at Pointe-Saint-Charles (Montreal Island). Tellier, an experienced educator, was assigned in 1849 to Bishop Rémi Gaulin* of Kingston as director of Regiopolis College. From 1850 to 1852 he lived at Toronto, where he gave valuable service to Bishop de Charbonnel*. He tried, unsuccessfully, to establish a college of the society there. In 1846 the Jesuits of Canada, through Father Boulanger who was then the visitor to the French missions in America, had agreed to devote their energies to education in the diocese of New York. In that year New York and Canada had been combined into a single mission, which was answerable to Paris but had a superior general in America. From 1853 Father Tellier lived and worked at New York. He was in turn prefect of studies at St Francis Xavier College at New York and rector of St John’s College at Fordham, and finally, in 1859, was appointed superior general of the New York–Canada mission. In this capacity he was in constant touch with his confrères in Canada. Each year he paid a canonical visit to the charitable organizations and houses of the society, and tried to improve the work of those under him. A contemporary wrote of Tellier in L’Écho du cabinet de lecture paroissial: “In the midst of a population that was foreign by nationality and religion, he was able through his activity, zeal, prudence, and firmness to win widespread esteem and approval for the Society he directed so worthily in this part of America.” He also showed breadth and boldness in his thinking: Le Gesù, a church adjoining the Collège Sainte-Marie at Montreal, was an example. In addition to the Sulpicians, who looked disapprovingly upon the erection of a large church in the neighbourhood of Notre-Dame, the Jesuits of the college themselves had reservations about such a project. The building of Le Gesù, the cost of which they would have to meet, would only aggravate an already trying financial situation. Thanks to his tact and sensitivity, the superior general managed to get the daring plan accepted. Confined by illness to the Hôtel-Dieu, Father Tellier was not able to attend the inaugural ceremony at Le Gesù in December 1865. On 7 Jan. 1866 he died peacefully at the Collège Sainte-Marie. His funeral took place two days later at Le Gesù, the first to be held in this church. ASJCF, Lettres des nouvelles missions du Canada, 1843–52, 1re partie, 41–67, 391–97. L’Écho du cabinet de lecture paroissial, 15 janv. 1866. La Minerve, 8 janv. 1866. True Witness and Catholic Chronicle (Montreal), 8 Jan. 1866. P.-G. Roy, Inv. concessions, I, 227–30. Les établissements des jésuites en France depuis quatre siècles . . . , Pierre Delattre, édit. (5v., Enghien et Wetteren, Belgique, 1949–57), I, 1264–65. Édouard Lecompte, Les jésuites du Canada au XIXe siècle (Montréal, 1920), 50, 65–66, 73–74, 246–47, 250–51. L. K. Shook, “St Michael’s College; the formative years, 1850–1853,” CCHA Report, XVII (1950), 41–46. Léon Pouliot, “TELLIER, RÉMI-JOSEPH,” in Dictionary of Canadian Biography, vol. 9, University of Toronto/Université Laval, 2003–, accessed April 24, 2019, http://www.biographi.ca/en/bio/tellier_remi_joseph_9E.html.